No evidence was found of resistance in three African sites - Kenya, Nigeria and the Democratic Republic of Congo. The study analysed blood samples from more than 1,000 malaria patients in 10 countries across Asia and Africa. 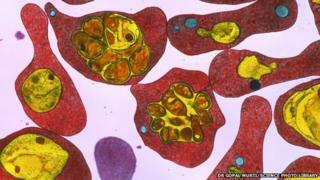 It found the malaria parasite had developed resistance to front-line drugs known as artemisinins, in western and northern Cambodia, Thailand, Vietnam, and eastern Burma, also known as Myanmar. There were signs of emerging resistance in central Burma, southern Laos and north-eastern Cambodia. Of particular concern was the corner of Asia on the Cambodia-Thailand border, where resistance to other anti-malarial drugs has emerged in the past. "Resistance is now present over much of South East Asia," said lead scientist Prof Nicholas White, of the University of Oxford. "It's worse than we expected. "We have to act quickly if we are going to do anything." Prof White said it might be possible to prevent further spread, but conventional malaria-control approaches would not be enough. "We will need to take more radical action and make this a global public health priority, without delay," he added. Meanwhile, a separate study, also published in the New England Journal of Medicine, reported early results of an anti-malarial drug in the pipeline. Commenting on the research, Dr Brian Greenwood, from the London School of Hygiene and Tropical Medicine, said: "The emergence of artemisinin-resistant parasites is a major threat to further advances in malaria control. "Every effort needs to be made to contain their spread while at the same time pushing forward with the development of effective alternative treatments that are almost certainly going to be needed in the future."